"I’m glad we’re talking about both women in STEM and the Philae news, but it’s like both important issues have been compromised and tarnished by the other." In the same week that I was given a bruise by a turnstile in Paddington that spookily resembled a Hubble space telescope picture, the space-scientists have done some spectacular space-science, and the media have left me confused and a little battered. Let’s recap: Last week, the Rosetta space craft released its probe, Philae, that’s sending us new data about the composition of a comet. Philae landed on a 2mile-wide comet, moving at 40,000mph, 40 billion miles away from earth, having been launched by the European Space Agency (ESA) 10 years ago. Just take a moment to take that in. I’ll wait here. 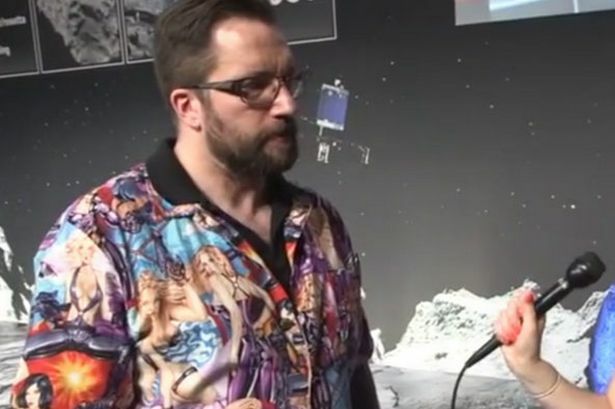 As part of the media coverage of this historic event, Dr Matt Taylor (a British Project Scientist at ESA) gave an interview wearing an ‘inappropriate’ and ‘sexist’ shirt, and Twitter had a LOT to say about it. Then we had the backlash to the backlash – those appalled by the detractions from such a spectacular achievement, chatting clothing when we should be chatting science. Even Boris Johnson muscled in. And if we’ve learnt anything from Richard Dawkins (apart from selfish gene theory and an immense appreciation of the diversity of life – credit where credit’s due! ), it’s that real issues can’t be debated on social-media; they need an open platform for gracious and balanced dialogue. So, what to make of it all? This is where it gets sticky because there isn’t an obvious side of the fence for me as a Christian Woman in Science (yep, we’re capitalising that bad-boy). I agree with a lot of what Twitter had to say, and as a woman in science (frankly, as a woman) I was a bit put out. They’re right – there is a deep-seated gender gap in STEM (Science, Technology, Engineering and Maths), and we need to call it out. But equally, Dr Taylor seems like a great guy and a fantastic scientist, and probably didn’t think much about what he wore that day – career-defining moment taking precedence? He’s this generation’s incarnation of the eccentric scientist: bright shirts, great beard, and tattoos (including one of the Rosetta craft itself!) Putting so much attention on his shirt detracts from the amazing things achieved when the global scientific community works together. It was a daft choice, but he apologised quickly and profusely for being unthinking– so can’t we let it go? While this hasn’t done anything to help systemic gender issues, there are clearly much bigger reasons why women aren’t in STEM. At uni, even I found myself wary of papers written by women. How did we get to that point as a society? A 2012 report showed that only 13% of the UK STEM workforce is female –there’s something much deeper and pervasive at work here. From up on my fence, this feels like a no-win situation. I’m glad we’re talking about both women in STEM and the Philae news, but it’s like both important issues have been compromised and tarnished by the other. In conclusion, we need to learn when and in what context to pick our fights, and maybe get the doc a wardrobe advisor … and to look at the positives, highlight the ground-breaking work of the Stemettes project, led by the phenomenal Anne-Marie Imafidon, helping make STEM more accessible to women and girls! There’s great work and progress in this area that should definitely be celebrated. // How Trump gives us the opportunity to be better men.